TRAILS OF THE WILD (1935, Ambassador) Kermit Maynard, Billie Seward, Fuzzy Knight, Robert Frazer, Wheeler Oakman. Kermit’s an agent trying to track down a missing man who disappeared in the mysterious “Ghost Mountain” area. He discovers a hidden mine complete with secret passages! It’s also the lair for a murderous gang of crooks. Well done. Kind of creepy in places. From 16mm. 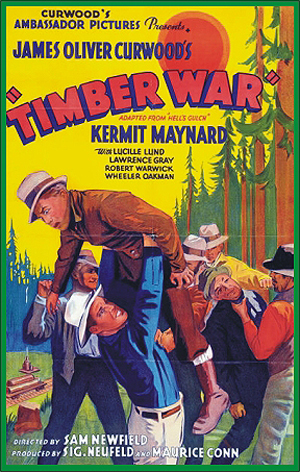 TIMBER WAR (1935, Ambassador) Kermit Maynard, Lucille Lund, Lawrence Gray, Wheeler Oakman. The unscrupulous manager of a lumber mill is paid fifty grand by a rival company to sabotage his own mill. Kermit comes to the aid of the mill owners and exposes the manager's nefarious scheme. 16mm. PHANTOM PATROL (1936, Ambassador) Kermit Maynard, Joan Barclay, Harry Worth, Paul Fix, Roger Williams. A mad killer escapes into the wilds of the Canadian woods. He fools lawmen by pretending to be a well known mystery writer. Kermit figures it all out and takes the appropriate action. 16mm. SONG OF THE TRAIL (1936, Ambassador) Kermit Maynard, Evelyn Brent, Fuzzy Knight, Wheeler Oakman. Kermit tries to intervene in a fixed poker game, but his sweetie’s dad has just lost his deed. He swears revenge on the card sharks that cheated him. Murder & intrigue follow. From 16mm. Each B-Western Collection contains four movies (or more) on two DVD discs. All films were originally mastered from 35mm or 16mm elements. The quality is beautiful. We know western fans will love these; but for those of you who have never tried B-Westerns, here’s your chance to take the plunge at a really affordable price—you’ll be hooked! These collections contain some of the best B-Westerns ever made, so grab ‘em while they’re hot!